Real Madrid Slippers at home. 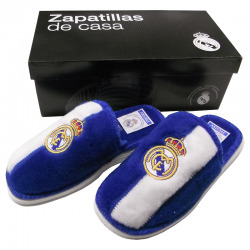 Real Madrid Slippers at home. White and blue. Embroidered crest. Velvet soft surface. Antislipping sole. Sizes: from number 30 to 47. 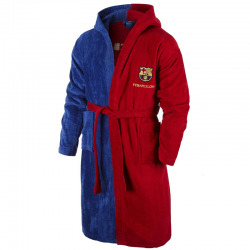 F.C.Barcelona Adult Bathrobe. It has a hood, belt and two side pockets. Composition: 100% cotton velour. Embroidered crest. Adult sizes. F.C.Barcelona Kids Bathrobe. It has two side pockets and a belt. Composition: 100% cotton. Embroidered crest. Kids sizes. 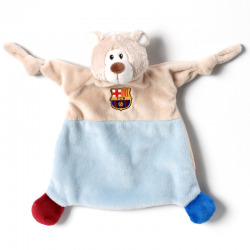 F.C.Barcelona Bear Doudou. Brand: Nici. Bear Doudou. Embroidered crest. Composition: 100% polyester. Size: 25 x 25 cm.. Machine washable. - Sizes: 140 x 20 cm. - Composition: 100% acrylic. - Stamped on one side. 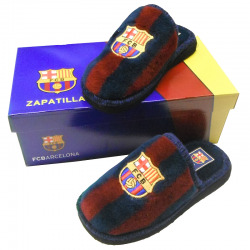 F.C.Barcelona Slippers at home. Red and blue. Embroidered crest. Velvet soft surface. Antislipping sole. Sizes: from number 30 to 47. F.C.Barcelona Lycra Thong Women. Red and blue. Composition: 95% cotton and 5% lycra. Printed crest. Adult sizes. 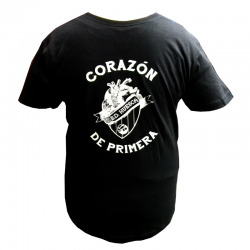 S.D.Huesca T-shirt. Brand: Bemiser. Corazón de primera. Printed crest. Composition: 100% cotton. S.D. Huesca Adult Away Shirt 2017-18. S.D. 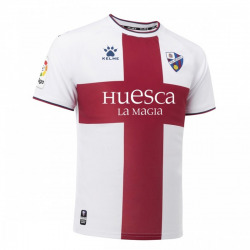 Huesca Adult Away Shirt 2018-19. Brand: Kelme. Short sleeves. Embroidered crest. Composition: 100% polyester. Adult sizes. S.D. Huesca Adult Home Shirt 2017-18. S.D. Huesca Adult Home Shirt 2017-18. Brand: Bemiser. Short sleeves. Embroidered crest. Composition: 100% polyester. Adult sizes. S.D. Huesca Kids Away Shirt 2018-19. S.D. Huesca Kids Away Shirt 2018-19. Brand: Kelme. Short sleeves. Embroidered crest. Composition: 100% polyester. Kids sizes. S.D. 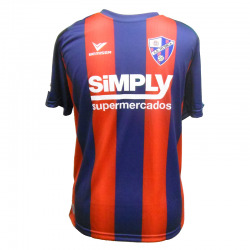 Huesca Adult Away Shirt 2018-19. S.D. 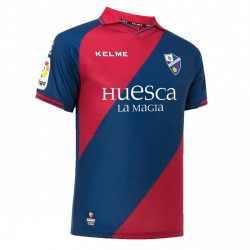 Huesca Adult Home Shirt 2018-19. S.D. 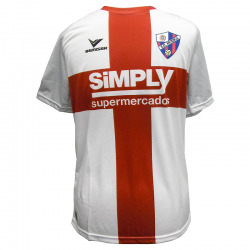 Huesca Adult Home Shirt 2018-19. Brand: Kelme. Short sleeves. Embroidered crest. Composition: 100% polyester. Adult sizes. 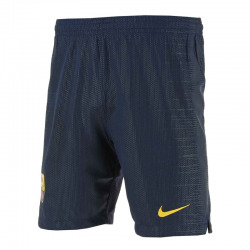 F.C.Barcelona Kids Home Shorts 2018-19. F.C.Barcelona Kids Home Shorts 2018-19. Brand: nike. Composition: 100% polyester. Embroidered crest. Kids sizes. 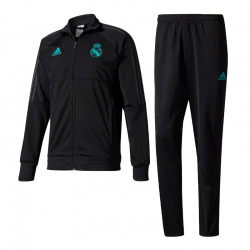 Real Madrid Training Presentation Kids Tracksuit 2017-18. Real Madrid Training Presentation Kids Tracksuit 2017-18. Brand: Adidas. Composed by zip jacket and trousers. Jacket: Front zip pockets. Raglan sleeves and ribbed cuffs. Pants: Front zip pockets. Elasticated waistband with draw cord. Embroidered crest. Composition: 100% polyester. Adult kids. 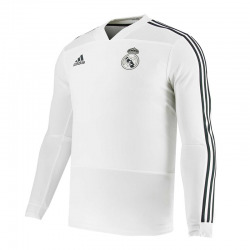 Real Madrid Adult Training Sweatshirt 2018-19. Real Madrid Adult Training Sweatshirt 2018-19. Brand: Adidas. Ribbed crewneck. Rib cuffs and hem. Composition: 70% cotton and 30% polyester French terry. Embroidered crest. Adult sizes. 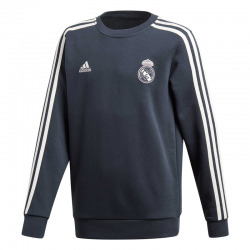 Real Madrid Kids Training Sweatshirt 2018-19. Real Madrid Kids Training Sweatshirt 2018-19. Brand: Adidas. Slim fit. Rib cuffs and hem. Fold-over gloves. Wind-resistant fabric. Embroidered crest. Composition: 100% polyester doubleknit. Kids sizes. 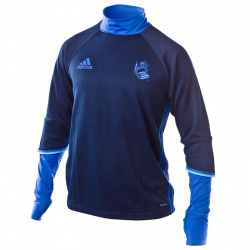 Real Sociedad Adult Training Sweatshirt 2016-17. - Brand: Adidas. - Composition: 100% polyester. - Climacool. - Shield embroidery. - Adult sizes. 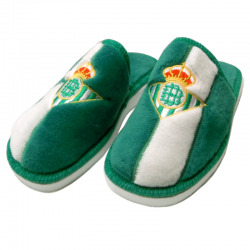 Real Betis Slippers at home. Real Betis Slippers at home. White and green. Embroidered crest. Velvet soft surface. Antislipping sole. Sizes: from number 30 to 47. 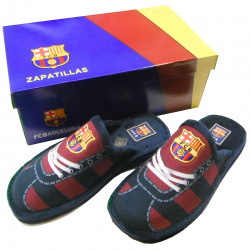 Real Betis Kids Slippers at home. 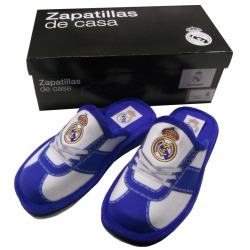 Real Betis Kids Slippers at home. White and green. Velcro closure. Embroidered crest. Velvet soft surface. Antislipping sole. Sizes: from number 25 to 29. Kids sizes. 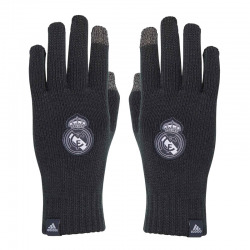 Real Madrid Gloves 2018-19. Brand: Adidas. Knit gloves. Conductive fingertips on thumb and index finger of each hand. Touch screen compatible. Ribbed cuffs. Embroidered crest. Composition: 93% polyacrylic, 6% polyester, 1% plain knit elastane. Adult sizes. 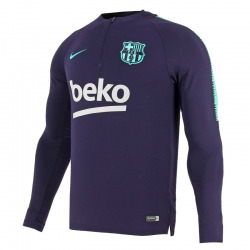 F.C.Barcelona Training Sweatshirt 2018-19. Brand: Nike. Sweatshirt with elasticated waist and cuffs. Neck zipper. Embroidered crest. Composition: 100% polyester. Adult sizes. 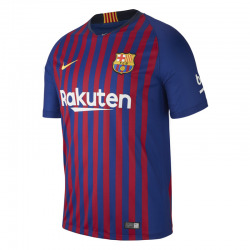 F.C.Barcelona Adult shirt 2018-19. Brand: Nike. Printed crest. Composition 100% cotton. Adult sizes. 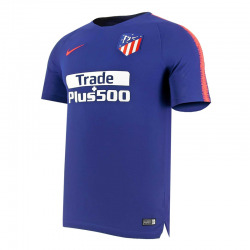 Atlético de Madrid Adult Training shirt 2018-19. Atlético de Madrid Adult Training shirt 2018-19. Brand: Nike. Training T-shirt. Embroidered crest. Composition 100% polyester. Dri-FIT. Adult sizes. 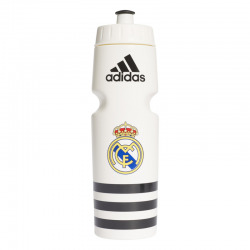 Real Madrid Bottle 2018-19. Brand: Adidas. Screw cap with pull spout. Easy grip design. Printed crest. Material: 100% polyethylene and molded injection system. Capacity: 750 ml. 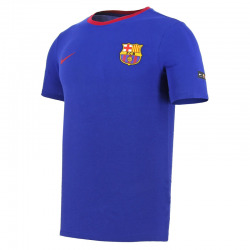 F.C.Barcelona Kids Home Stadium Shirt 2018-19. F.C.Barcelona Kids Home Stadium Shirt 2018-19. Brand: Nike. Short sleeves. Embroidered crest. Composition: 100% polyester. Dri-fit. Kids sizes. Atlético de Madrid Football Mini 2018-2019. Atlético de Madrid Football Mini 2018-2019. Brand: Nike. Machine-stitched construction for soft touch and high durability. Butyl bladder for best air retention. 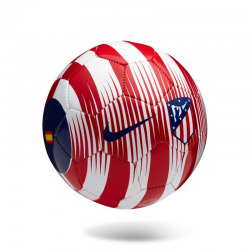 Ball with Atlético de Madrid crest and Nike logo. Nylon cover. Composition: 60% rubber, 15% polyurethane, 13% polyester, 12% EVA. Size 1. 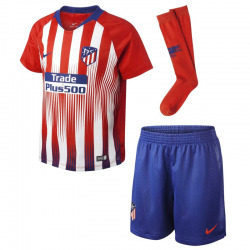 Atlético de Madrid Little Boys Home Kit 2018-19. Atlético de Madrid Little Boys Home Kit 2018-19. Brand: nike. Includes short-sleeved shirt, shorts and socks. Composition: 100% polyester. Embroidered crest. Lttle kids sizes. From 4 to 8 years.